So, you’ve just purchased a bag of your favorite gourmet coffee beans. Are you wondering why you’re not getting the best tasting coffee possible, despite using a good coffee maker and a good blend of beans? Then it must be in your coffee grind. Sadly, the grinder is often overlooked, but it is as important as having a good coffee maker. Having a good grinder is absolutely essential if you want to get good coffee. There’s a reason why coffee shops use high quality commercial grinders, and it’s not just because these are more durable and can handle the stresses of grinding large quantities of coffee on a daily basis. The quality of your grind has a great influence on the quality of your coffee. If you have an underperforming coffee grinder, it does not matter if you’re using the best tasting blend of coffee beans from the most popular coffee roaster in the world and the most expensive coffee maker. So here are three tips that will help you get a better coffee grind, which will ultimately help you get a better cup of coffee. Tip 1: Know your grinder. The first tip is to know your grinder. What type of grinder are you using? There are two basic types of coffee grinders: the blade grinder and the burr grinder. The blade grinder is the less expensive of the two. It uses stainless steel blades to slice up and dice the coffee beans. The size of the coffee grind depends on how long the blade grinder has been running. This presents a couple of problems. For one, there is guesswork and estimation involved while grinding. How long should the grinder be running to get a fine grind? You’ll go through several batches before you get the timing down. Second, the blades heat up while they’re slicing up the coffee beans. The resulting heat will transfer to the coffee grounds, which causes them to get burnt, and leaves a burnt taste on your coffee. The burr grinder grinds coffee beans by crushing them between a non-moving surface and a rotating wheel. 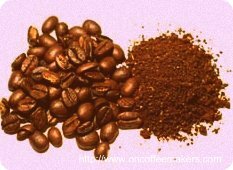 The size of the coffee grind depends on the position of the burr relative to the non-moving surface. This means that getting the right grind size does not require as much estimation as using a blade grinder. Moreover, burr grinders give a more consistent and more even grind. Although burr grinders are more expensive, getting a good burr grinder is a good investment. Tip 2: Know the ideal grind size for your coffee maker. The second tip is to know the ideal grind size for your coffee maker. When you drink coffee, are there any coffee grounds in your cup? If there are, then your grind size is too fine. As a general guideline, use medium grind for automatic coffee drip makers, coarse for French press and percolators, and fine for espresso machines. Browse through the manual of your coffee maker and see what the ideal grind size is for your device. Tip 3: Your coffee grind must be even and consistent. After grinding a batch of your coffee beans, look at the coffee grounds. Are they even and consistent? Having an uneven grind will result in poor coffee extraction, which ultimately leads to poor coffee. Even if your grind setting is coarse, the size of the coffee grounds should be even all throughout, and not a mixture of uneven sizes. Having an uneven grind means that not all the coffee grounds will be fully saturated during the extraction process, this does not help with maximizing the flavor of your coffee at all. This is why having a good grinder is important.